On-site Repair, small to large, Daniel Tarr has the experience. 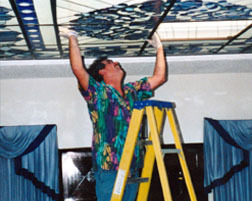 Daniel's attention to detail and love of glass will insure that your repair is the best. 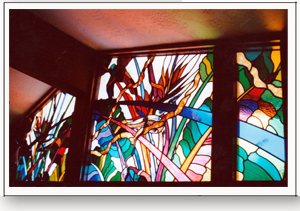 Daniel began his glass art career in 1980 when family friend and watercolorist Ron Aviet urged him to join him as a tenant in an outdoor artist village in Laguna Beach, Calif. 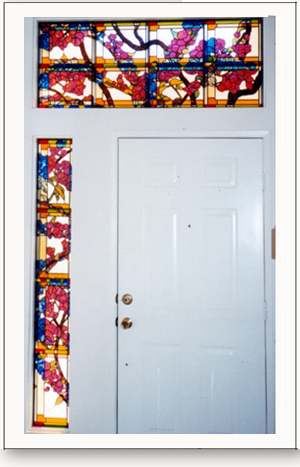 He rented a small space and created small leaded glass items to sell. Within 5 years, he had developed his skills to a level such that he was selected to participate in several juried art festivals around Laguna Beach and SoCal. At the same time, he started taking commissioned work. Daniel divided his time between design and production work at Alpine Stained Glass and his own studio while traveling around the West to connect with galleries to represent his work. He moved his studio and household to Maui in 2005 and opened his business to the busy building market in Hawaii. In 2016 Daniel and Su have returned to San Diego to continue his repair, restoration, custom design, and gallery work.